For individuals this includes role placement, executive coaching, performance development, individual development plans, employee engagement, leadership capabilities, and behavioural competency development. 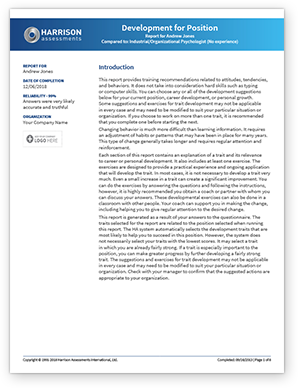 Our Job Success Analysis Report provides key insights into role placement by comparing individuals' behaviours and traits to specific job criteria and indicating their probability of success. It provides essential data needed to make promotion or job rotation decisions and identifies the individual's development needs for the specific role. Harrison works with over 1000 expert coaches world-wide to provide our customers coaching support using the Harrison reports. If customers wish to use internal coaches, we provide training and certification. The Job Success Analysis report compares an individual's behaviours to the proven success factors for specific jobs. Our Paradox Report provides key insights into paradoxical behaviours that can either help or hinder success. Our free Leadership Development App provides each manager the option to receive a weekly reminder of a key factor related to managing each employee. The content is based on our How to Manage Report and Engagement and Retention Report. These weekly reminders are free to each of your managers who also have direct access to generate reports with more detailed information. Our Development for Position Report identifies key gaps related to job success and provides clear and practical employee development plans that target their specific development needs. These plans are tailored to a selected job or behavioural competency and give stepped exercises to develop an employee's required capability. 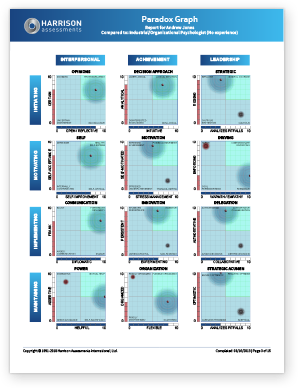 Behavioural competency reports compare an individual's behaviours to the behaviours needed for specific types of competencies including leadership competencies, emotional intelligence competencies, collaboration competencies, or any competencies that are customized for your organization. There is no need to have separate assessments for every talent function. 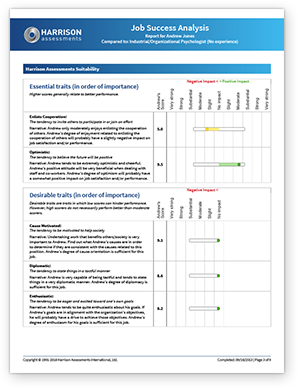 Harrison's SmartQuestionnaire measures 175 workplace factors in only 25-minutes and can be used to generate reports for all of our talent functions, saving you time and money.